Silverfish are scaled covered, fast moving insects. In Australia there are around 23 described species. It is reported that around 5 species have successfully invaded manmade structures restricting their activities to relatively undisturbed areas, such as bookcases and storage rooms. They damaged paper, fabric and other materials. If you need to get rid of Silverfish, you need for a professional Pest Controller, Control-A-Pest Pty Ltd. We are here to help you with Silverfish removal, give us a call now. Silverfish feed on most types of human food but, prefer starchy material. When they attack paper and photographs, it is usually the outer shiny layer that is most damaged, along with book bindings, cottons, linen, glue and wallpaper. They can be quite widespread in dwellings. A professional Silverfish exterminator, Control-A-Pest Pty Ltd, can provide you with assistance in Silverfish extermination. 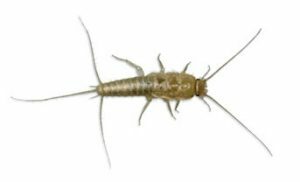 If you have a problem with Silverfish, call us here at Control-A-Pest Pty Ltd for advice and treatment, contact us now.